Wow, I can’t believe how long it has been since I last blogged. Time just seems to get away from me sometimes. I think about blogging and what I would be telling you, and then all of a sudden it is 5pm and time to start dinner, and another day has gone by without a blog entry. So today I made myself sit down and write to all of you. 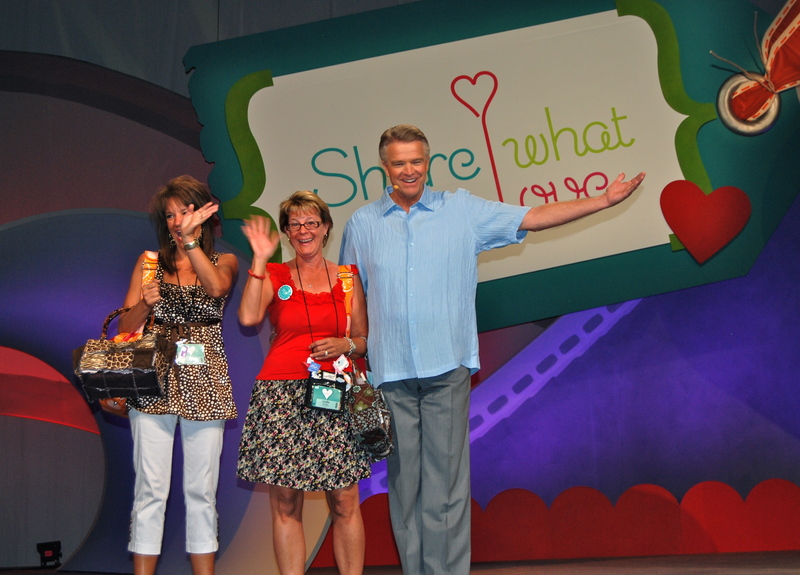 Had a great time at the Stampin’ Up conference. 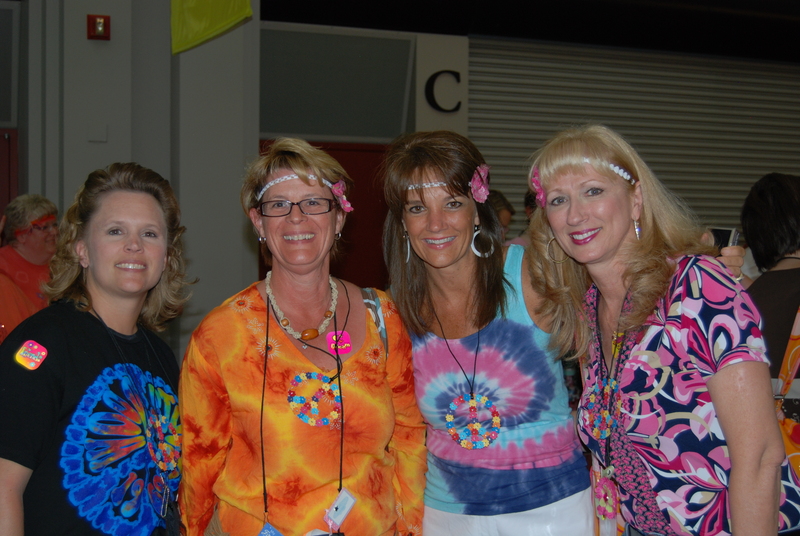 The first night was 70’s Night. We were all suppose to dress up in 70’s outfits. I’m not usually one to dress up, but deceided what the heck. I was able to find some things in Gunnison and throw this outfit together. I love going to conference because there are so many fun people to hang out with, lots of ideas and inspiration. We usually have a general session where there are awards given, information given, prep talks, and demos. Then in the afternoon there are classes. On our second full day there, Lorri (my upline, friend, and room-mate) and I got a late start. As we were walking in Lorri noticed this young man. 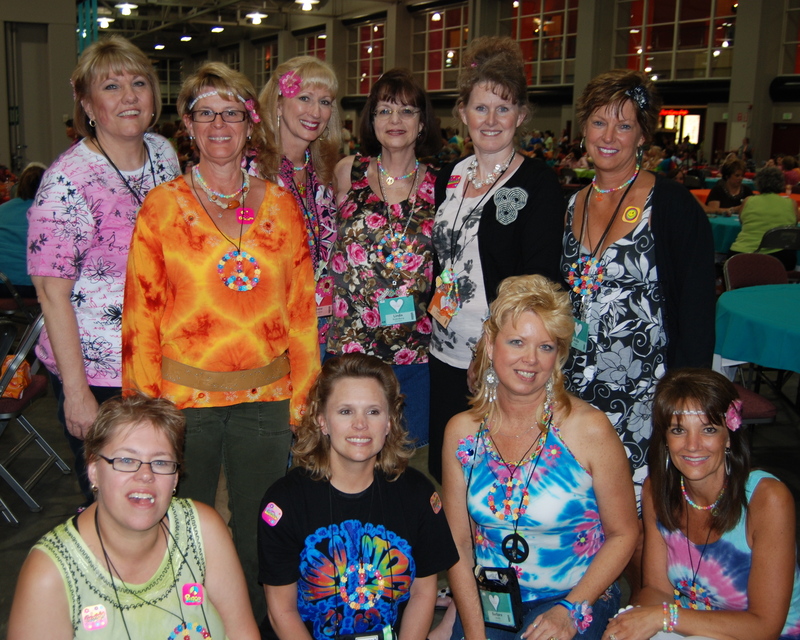 (Not that a man wouldn’t be easy to spot, they are out numbered about 1,000 to 1 at a stamping conference). He came up to us and asked if it was just the 2 of us. We said right now there was, our friends were waiting inside, saving seats for us. 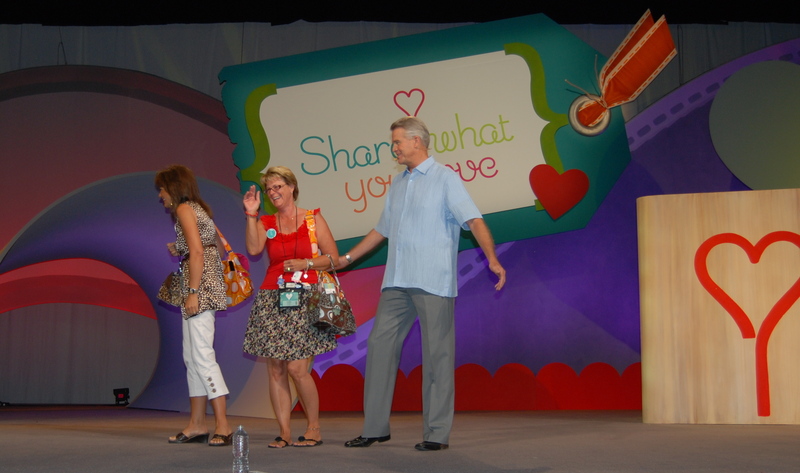 He said he worked for Stampin’ Up and would we like to go back stage to watch the general session. Lorri thought he was kidding, but we said SURE. So we got to go back stage and see all that happens to make the general session come to life. 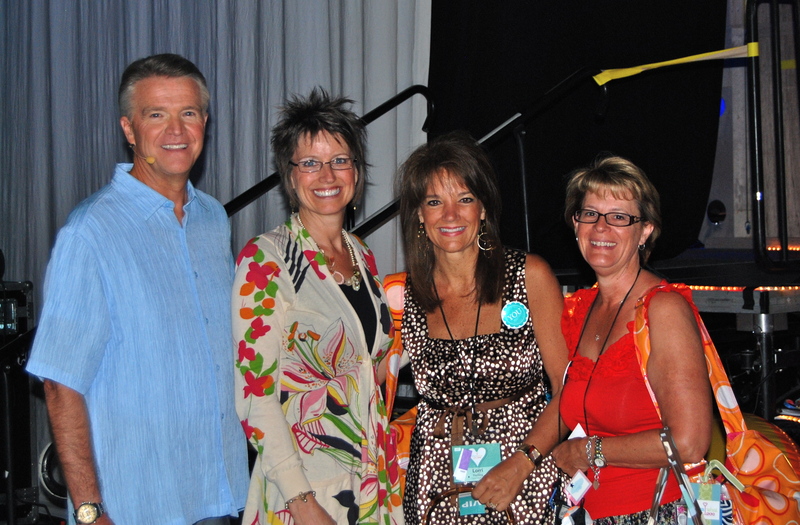 We were lucky enough to meet Shelli the co-founder and CEO of Stampin’ Up and Dale, the president of Stampin’ Up, who was waiting to go on stage. He was talking to us and then for some reason he deceided that it would be fun to bring us on stage. At first we said “No Way” then He finally talked us into it, but only if we didn’t have to say anything. We are introduced, and Dale tells how we were asked to come watch what was happening back stage and all the fun we were having. He then said that we were having so much fun that maybe he should turn the mic over to us. Now I just laughed, because I know that there was no way he was going to do this. They had been talking before hand about the tight schuedle they had and how they couldn’t really change anything. But I guess when Dale sid he was going to turn the mic over to us, Lorri got a look of terror on her face. 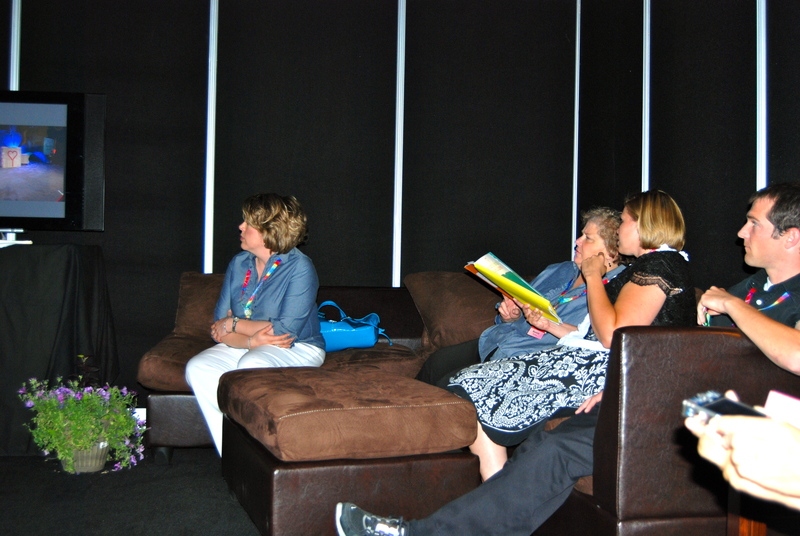 and were able to watch the rest of general session from the green room. Thanks Cam for picking us and the wonderful highlight of the conference.